A suspect behind the wheel of a stolen Tesla Model X crashed in San Jose Tuesday morning while being pursued by authorities, according to the Santa Clara County Sheriff's Office. A man stole a Tesla Model X from a residence in unincorporated Los Altos Tuesday morning and later crashed the vehicle in San Jose while being pursued by authorities, according to the Santa Clara County Sheriff's Office. 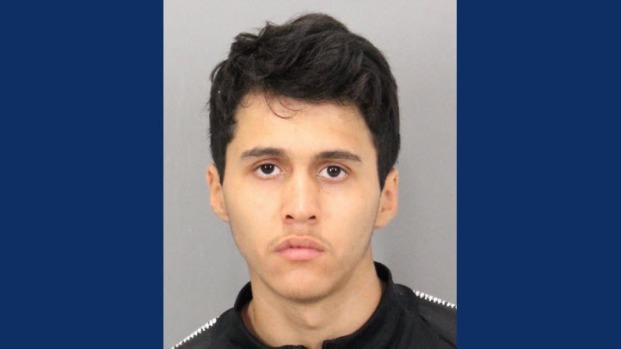 The suspect, identified as Eric Vargas-Bonilla, fled from the crash scene near the SAP Center but was later located, according to sheriff's officials. Deputies first responded around 5:10 a.m. to the residence in the Los Altos area after receiving a report about a residential burglary that had just taken place, according to the sheriff's office. Vargas-Bonilla stole undisclosed items from the residence in addition to the 2017 Tesla Model X, the sheriff's office reported. Deputies eventually spotted the Tesla along southbound Interstate 280 and started a pursuit, according to the sheriff's office. The car chase came to an end when the suspect crashed in the area of Delmas Avenue and W. Santa Clara Street, but the suspect managed to flee from the vehicle. A large perimeter was set up and authorities used K9s to help in the search for the suspect, according to the sheriff's office. Vargas-Bonilla was located at about 6:11 a.m. by deputies and police officers.